This Raspberry Baklava post has been sponsored by The Fillo Factory. Even with nut allergies, you can still enjoy baklava with this nut-free twist on the traditional Mediterranean treat – raspberry baklava. Fruity and easy to make, baklava with raspberries and chocolate is a favorite summer treat. Succulent, light, and perfect to bring to potlucks and parties or enjoy with a cup of tea in the afternoon out on your deck or patio. If you know me, you know that I was a picky anorexic eater as a child. However, I didn’t have problems eating sweets but alas, my mother was a horrible baker. Seriously, she couldn’t bake a cake to save her life. I remember one time (I was 5 or 6), my aunt came over with ingredients in tow to show mom how to bake. The idea was to simultaneously make a SIMPLE CAKE. This sweets-deprived girl was beyond ecstatic that soon there will be not one but TWO cakes to eat. Nothing can go wrong, now that aunt is here and mom will copy her every step to a perfect, sweet treat, right? Wrong! If I were to believe in curses, I’d say my mom is CURSED with ill baking skills. Even with an excellent baker by her side, mom’s cake turned out flat and unsightly. She just couldn’t do it. My dislike for baking may have something to do with it. I never liked measuring ingredients and I’m intimidated by the science of it all and how easy it can flop. All the effort and nothing to show. However, that doesn’t stop me from trying (I like a good challenge). Although I waited four decades to start using fillo dough (don’t wait that long, it’s not as hard as it seems! ), once I tried it there was no going back. FILLO is so versatile, you just need to let your imagination run wild. Use it in sweet and savory dishes. From baklava cheesecake to spinach and cheese pie, fillo has become the staple ingredient in my kitchen. 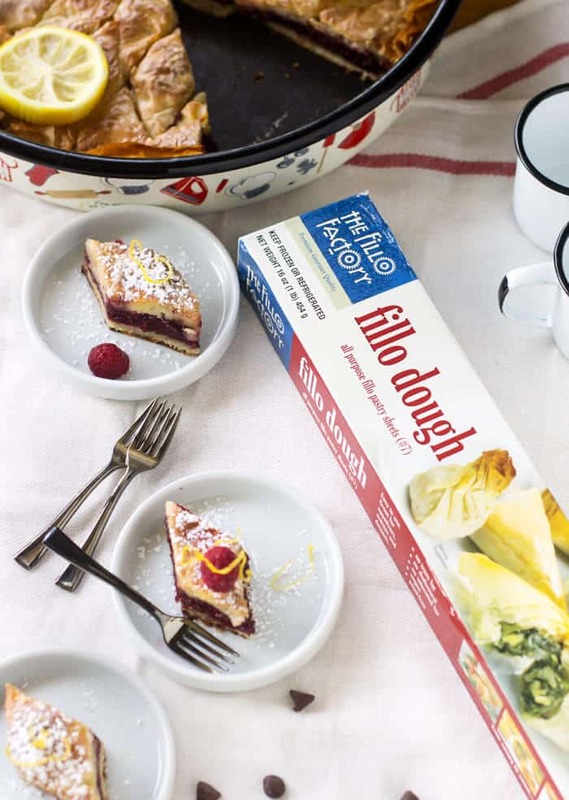 I especially love The Fillo Factory’s different styles and thickness of fillo dough you can’t get from other brands: regular, whole wheat, spelt, organic, and country style. 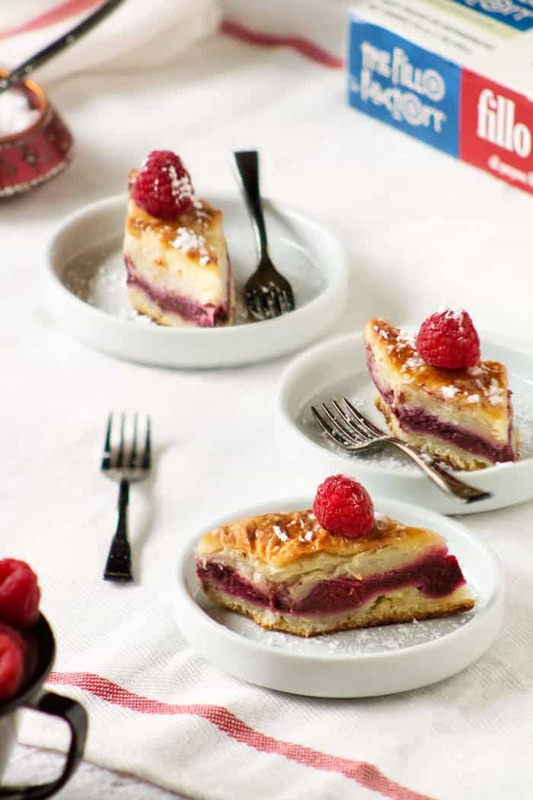 So, if you love a good challenge too, this raspberry baklava is one of the easiest dishes to make with fillo. Besides, it’s too good not to try it! Substitute raspberries with cherries or your favorite berries (or a mix of berries). In a medium saucepan, combine sugar, lemon slices, and water; bring to a boil. Reduce heat and simmer until sugar dissolves and the mixture is syrupy about 10 minutes. Set aside to cool. Meanwhile, heat all ingredients for the raspberry filling over medium-low heat until chocolate is melted. Remove from the heat. In a medium-size bowl, beat together the eggs and sugar using an electric mixer. Add sour cream, oil, and semolina. Mix just to combine. Set aside. Unroll the fillo dough. 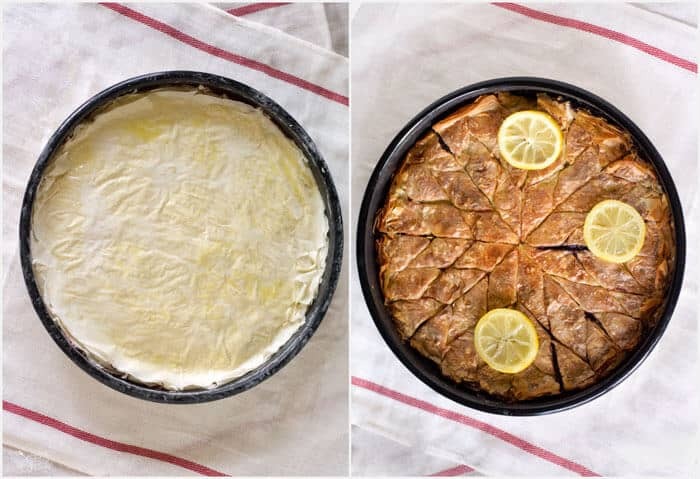 Trim the whole stack, if necessary, to fit the 11-inch round or 9×13-inch rectangular baking pan (the easiest way to do this is to put the pan over fillo sheets and cut the excess with a sharp knife). Separate the sheets in half. Cover with a clean cloth to keep from drying out as you work. If you work fast enough, you don’t need to cover it. Using the half stack of fillo, place two sheets of fillo dough in a greased baking pan. Spread with 3-4 tablespoons of the semolina mixture. Repeat with the remaining sheets, topping with the mixture after each sheet. Add the raspberry filling and distribute evenly. Continue layering the other half of fillo dough and semolina mixture, finishing with two layers of fillo on the top. Using a sharp knife cut the unbaked baklava into squares or diamonds all the way to the bottom of the pan. Lightly sprinkle the top of pastry with cold water. This inhibits the pastry from curling. Bake baklava for 50-60 minutes or until golden and crisp. Remove from the oven and immediately spoon syrup over it (always pour cold syrup over hot baklava or vice versa). Let cool for at least 4 hours or overnight before serving. Keep refrigerated. 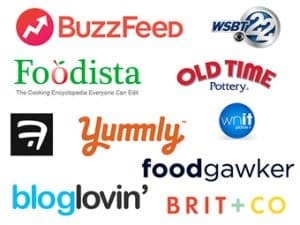 Become a subscriber for recipes updates, tips, and freebies. Sign up HERE and get your first freebie! 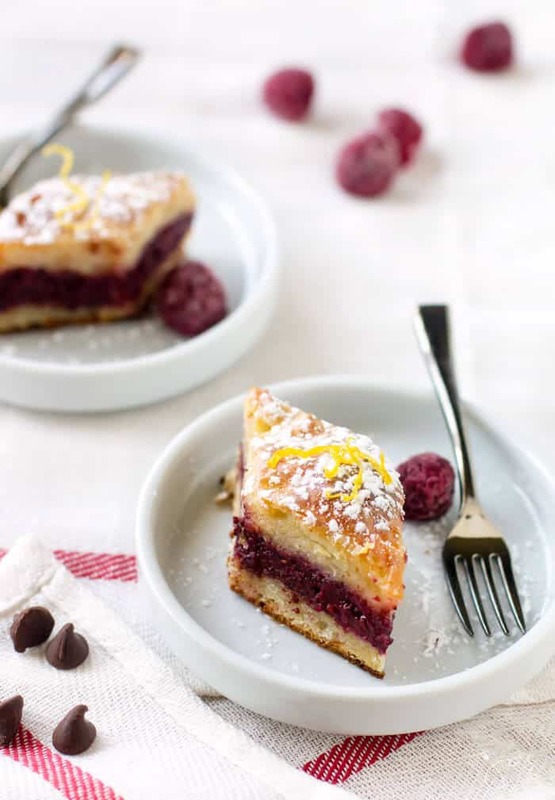 A nut-free twist on the traditional Mediterranean treat, this raspberry baklava is a new favorite fruit treat. Unroll the fillo dough. Trim the whole stack, if necessary, to fit the 11-inch round or 9x13-inch rectangular baking pan (the easiest way to do this is to put the pan over fillo sheets and cut the excess with a sharp knife). Separate the sheets in half. Cover with a clean cloth to keep from drying out as you work. If you work fast enough, you don’t need to cover it. 10. 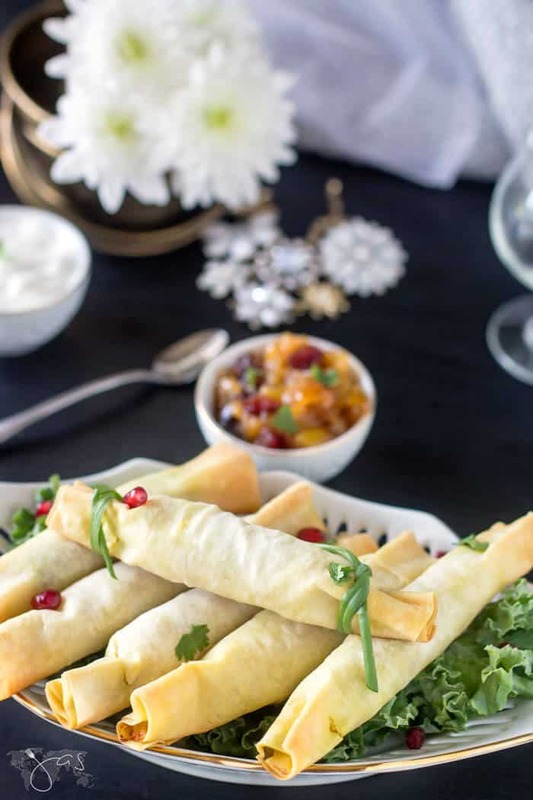 Bake baklava for 50-60 minutes or until golden and crisp. 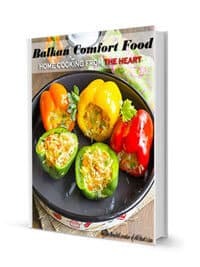 Remove from the oven and immediately spoon syrup over it (always pour cold syrup over hot baklava or vice versa). 11. Let cool for at least 4 hours or overnight before serving. Keep refrigerated. Featured on: Oh My Heartsie Girl, Cookin’ Mimi, Lou Lou Girls, and Katherine’s Corner. 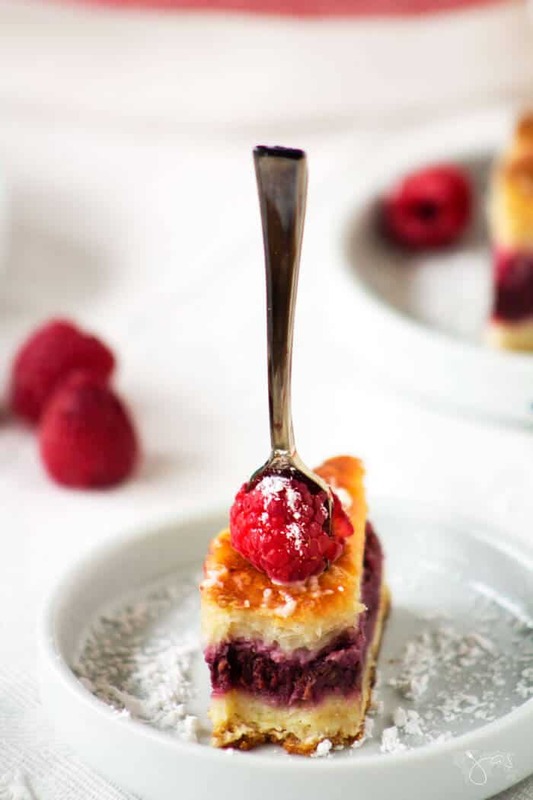 Oh Jas this recipe for the raspberry baklava looks wonderful! I can’t wait to try it. I’m not sure I’ll be able to do such a beautiful job with the cut- pattern- but I will try!!!!! Thank you, Lauren! However you cut it, it’ll taste the same 😀 Enjoy the rest of your week and thanks for stopping in! Interesting and delicious twist on baklava! Thanks for sharing at Fiesta Friday! We will love your Raspberry Baklava, it looks so good. Thanks so much for sharing it with us at Full Plate Thursday and you have a great weekend! I love baklava – don’t think I’ve ever had it with fruit. It sounds great – thanks for sharing at the What’s for Dinner party. Hope you have a wonderful week! I absolutely love baklava. This looks so yummy! Thanks for sharing with SYC. Perfect recipe for a tree-nut-free house! I’ll have to try this one out!!! Jas, I love anything with raspberries and I love baklava. Such a win-win combo! Isn’t it great when everything you like aligns just so? 😀 Thank you, Carol, for visiting! 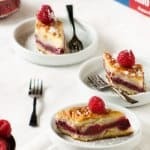 I love the nut-free twist on the classic and the raspberry! YUM! Thanks for sharing with Thursday Favorite Things – I’m featuring you tomorrow! This actually sounds yummy with the raspberry filling!!! Thank you for sharing on #omhgww last week, hope you know that this is being featured and I have Pinned to share on Pinterest and Facebook!! Hope to see you again soon! 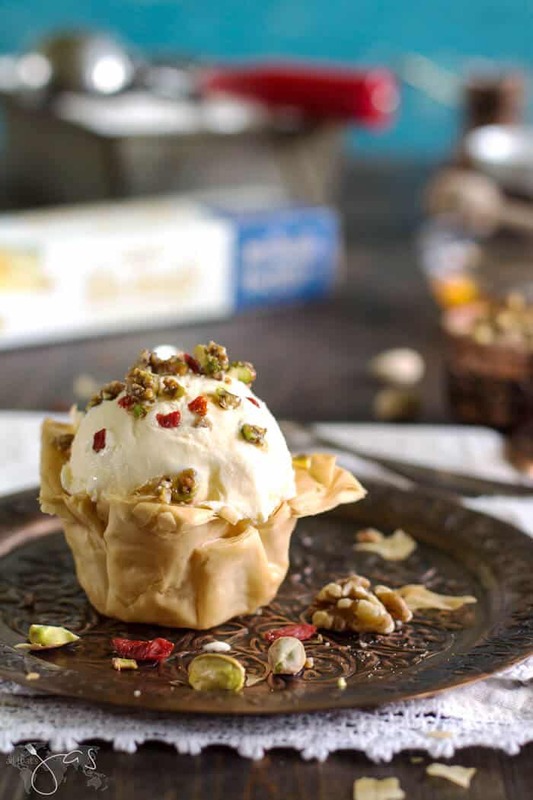 Baklava is one of my favourite treats and I love this nut-free version, Jas. Pinning and sharing, including on the Hearth and Soul Facebook page, later today. 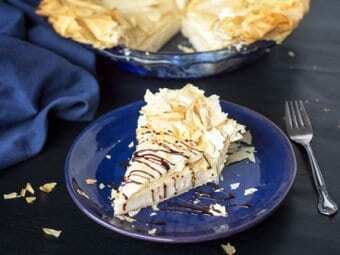 Thank you so much for bringing this wonderful dessert to the Hearth and Soul Link Party. Have a wonderful weekend! I have a question: under raspberry filling you have the semolina and a second cup of chocolate chips. Does the semolina and second cup of chocolate chips get added to the rest of the raspberry filling, or is it separate? That’s a typo. It’s only one cup of chocolate chips. Thank you for catching it! I shouldn’t be writing posts late at night, lol. Sorry about that! This is so beautiful- I love the way you cut it in the rounded pan to be a star! Total showstopper! 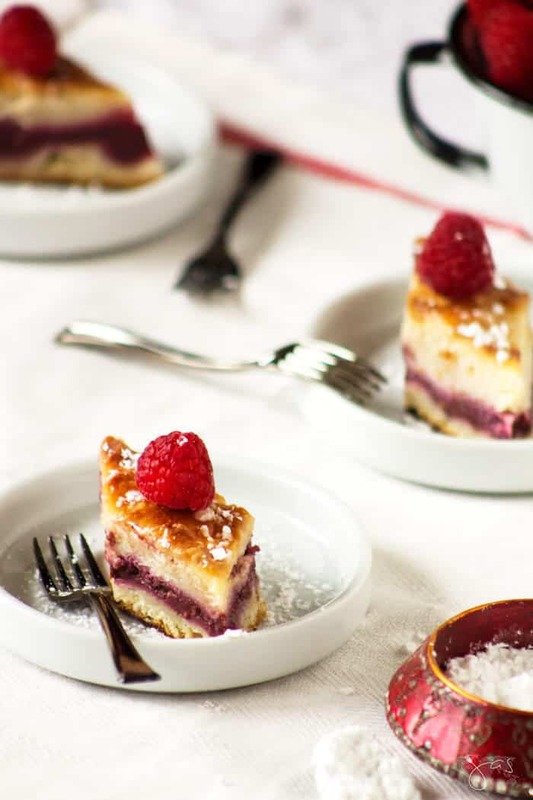 Raspberry Baklava – this looks so good. Congratulations of the well deserved Feature on Friday Frenzy.